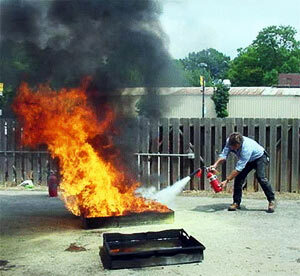 Fire safety refers to precautions that are taken to prevent or reduce the likelihood of a fire that may result in death, injury, or property damage, alert those in a structure to the presence of an uncontrolled fire in the event one occurs, better enable those threatened by a fire to survive, or to reduce the damage caused by a fire. Fire safety measures include those that are planned during the construction of a building or implemented in structures that are already standing, and those that are taught to occupants of the building. These should be conducted quarterly. Do your employees know what to do in an emergency? The law states that dialling 10111 is not enough. Here’s access to a system that’ll ensure your company is 100% compliant with the OHSA! The fire alarm goes off because someone accidently left a multi-plug on. A fire started on the second floor of your building and your employees are in a panic. Are you confident that your employees know exactly what to do in an emergency? Have you practiced an emergency drill a few times? Is the list of emergency numbers written on a notice board? • Identify hazards and asses risks.